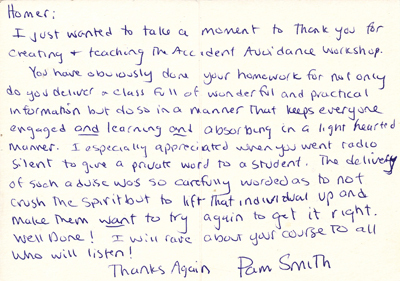 What are they saying about the Accident Avoidance Workshops? FACEBOOK page, click here to view. About 2 weeks ago my son sent me a text message that made my heart stop. It read, "Mom, that driving class you made me take just saved my life!" When he was 4, our babysitter pulled him from our burning house. Now, at 18, your class saved him again. Obviously, God has plans for my boy; thank you for being instrumental in keeping my son alive. I put my daughter through driver’s ed. I paid $450 for a program that was worth $150. Then I put her through the Workshops. I paid $200 for a program worth a thousand. I wanted Chelsea to feel more confident in her driving ability and I wanted to have more confidence in her driving ability. Chelsea said she learned a lot in class and had fun doing it. You have really made me stop and think about the way I drive. I had asked Chelsea yesterday after school, on a scale of 1 to 10 with 1 being the least and 10 the greatest what did she feel her confidence level in her driving was before she took the workshop she said a "5" and I said what about now, after taking the workshop she said a "8". She also said she had a lot more practice and experience to get in driving before she would say it is a "10". Thank you all so much for helping us!!! There hasn't been a day that has gone by since our workshop with you and our daughters that we haven't used, thought of or done something differently because of our new learnings from you! some of my friends have even started backing into parking spots!! The wealth of practical (and sometimes HIGHLY amusing!) info. you shared with us in a short period of time was amazing. Seeing the kids behind the wheel, practicing how to actually work the car in extreme situations was fantastic. it can't be taught in a book, and you are an inspiring teacher in so many ways! Encouragement, empowerment, enthusiasm, solid advice, providing experiences, practical info., befriending all.... you provided a great combination of all of that and more. i hope all students and parents have an opportunity to take the training you offer, it will, for a FACT save life and limb. we'll see you soon with our next 2 drivers! Homer has a God-given talent to connect with every student and there is no substitute for the hands on driving they get in his class. You drag your reluctant kid into class and then drag the same enthusiastic kid away. I can't recommend this class highly enough and think every teenage driver should attend it." Uncle Homer made it fun, and we learned more than we ever did in Drivers Ed. They make no attempt to make Drivers Ed fun … but this class teaches you not just the drivers ed stuff, but how to deal with the moment when everything matters. And you cannot put a price or time limit on extending your life. We also got a fresh taste of reality, and how we cannot think of driving a car as a game. The information we got about driving was very important, but what was even more important was the mental preparation it gave us. This class gave us what we need to not panic in a emergency situation, and know what to do. One day, hopefully not soon, when I avoid a crash because of the information I was given, expect a call from me saying thank you, knowing this program saved my life. I wanted to say thanks for a great class Gabe and I sure got a lot out if it! It was time and money well spent. I also wanted to pass along something Gabe said on the way home. He said "Dad its to bad someone like that can't be a part of your every day life". I thought WOW what a compliment!! He also said he thought you would be a great math teacher if you bring that enthusiasm and teaching style into the class room. Thanks again for the good work. Thanks so much for the great job that you do with this class. You really make it fun for the kids and the parents. It has caused us to make changes in some of the things we do as adults – for example, no cell phones while driving! My son John enjoyed the weekend, and I’m sure he didn’t expect to, because he doesn’t like giving up so much of his time on the weekend. But it was definitely time well spent. Keep up the good work training our kids in this important area of their lives. Your class was a life-changing experience for my son, Nick. He was adamantly and vehemently opposed to the whole thing. As you are certainly aware, 15 year-old boys are quite knowledgeable about all things driving- related, and Nick was convinced there was nothing he could learn. On Friday morning, after only attending the CLASSROOM session, he apologized for all the grief he had given me, saying, "He really made me think about what a big deal driving really is." Already, I have got my money's worth. Little did I know how much more we would both get out of the driving session. After our first pass through the first exercise, Nick was convinced he would never be able to succeed with our gigantic car. But you gave him excellent advice and some confidence that he could actually accomplish the "impossible" and he did. Most importantly, you showed him there might be a thing or two he doesn’t know about driving. When he missed the brake pedal on the first braking exercise, it was another eye-opener for him (and you were right, it only happened once). Thank you, thank you, thank you for all you taught Nick and me. Your ability to relate to the kids, your calm, confidence-inspiring demeanor, and your teaching ability made this the most worthwhile thing I have done for my darling boy in a long time, possibly ever. We will both be practicing the exercises in the book ( with no objection from Nick ) until we are pros. I wish I had the words to fully express my most heartfelt appreciation for what you do. PS I have strongly urged a few friends who have "experienced" drivers to take this course. I believe it would be at least as beneficial for someone who thinks they have this driving thing down as it was for us. You may remember that just prior to the Area Volleyball Championship against Pope, my daughter Shannan was involved in a single car accident on the way to the game. We were very blessed that she and her teammate were ok, but the circumstances surrounding this event changed my prospective on teenage drivers. As parents, we thought we had done everything possible to make sure she was prepared to handle the responsibility of driving a loaded "weapon". She drove for 1.5 years with no events - that we were aware of!!! - and not until this accident on the way to Area Championship did I realize I had not properly prepared her for driving. Shannan was just driving out of our neighborhood and had not even reached the speed of 15 miles per hour. She was distracted and instead of hitting her brakes, she proceeded to cross the center-line of the road and hit at least 20 pine trees which were along the side of the road. She and her teammate were fine, but her car was totaled. My first normal thought was how did she travel about 100 yards to the other-side of the street and hit so many trees without even hitting the brakes! Then it hit me, I had never practiced an emergency situation with her. These are things we just do not practice!!!! My youngest daughter Samantha, sophomore at Lassiter, just completed the Accident Avoidance Workshop. Sam is the last of five daughters to graduate from Lassiter. She has had her license for 2 months. I understand you were very kind and generous to allow this business to utilize your facilities for the instruction. As a parent, I have given her a fighting chance to avoid an accident and the consequences which follow. This business did a great job and should be applauded for all it is doing to make our kids and our families safer on the highway. I for one am tired of watching the pain and suffering within my own family and others! Sorry for long e-mail, but I feel strongly about this and stand ready to put my money where my long e-mail is. Every New Driver needs to experience this and if not this business, a similar well run and trained business should be able to utilize a facility which is paid for by our tax dollars and provides the best chance for our kids to avoid an accident or death! Your willingness to help may just save our family and yours from the cost or pain of a teenage accident. First, let me thank you for an invaluable 6 hours. Clare and I both learned so much and had a great time while we were doing it. I feel so much better about Clare's ability to handle herself and the car in an emergency situation and can't thank you enough for that. I have already raved about the class to everyone I've spoken with that has kids close to driving age and will continue to do so. I also have three boys, ages 14, 12 and 11, so will be seeing a lot of you in the next few years! My son William and I attended the Accident Avoidance Workshop at Walton this week. The class was excellent and very beneficial to both William and I. Thank you for sponsoring this program at Walton. I would encourage that this class be offered on a regular basis and all students be highly encouraged to attend. It is such a low cost to pay to protect something so dear to all of us. My son said this was 10 times better than the drivers education class he had taken. The driving part was the most beneficial and I could tell all of the kids had never been exposed to these types of situations before.